Celebrate Big Brother (or Sister) with Baby Fables! 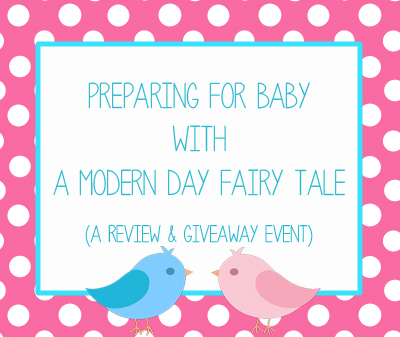 When it comes to preparing for baby, baby of course receives a TON of gifts. This is only natural of course, but can make the older siblings feel left out...one of our plans to keep the new sibling jealousy to a minimum is to create a super special big brother gift to give my little man at the hospital when baby sister arrives. Matching t-shirts, candy, stickers...perhaps a new train? We want something super special to let our little guy know that it is HIS big day too...and of course, we need something cute to put it all in. The wonderful Etsy shop, Baby Fables, has the perfect solution with their Big Brother/Big Sister Kits!! They were kind enough to send me the Big Brother Express Kit to review. 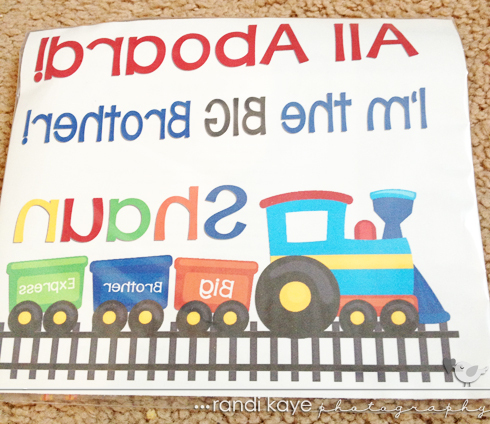 If you've followed my blog long, you know that my little man is train obsessed, so this design was absolutely perfect for him! How absolutely adorable is this? I love the fun, bright colors...just perfect for the new big brother. My son also loves anything with his name on it, so it being personalized is a definite bonus for him. Each kit contains a tote bag and a matching iron on so you can also create a custom t-shirt (or pillowcase, or whatever else you choose). 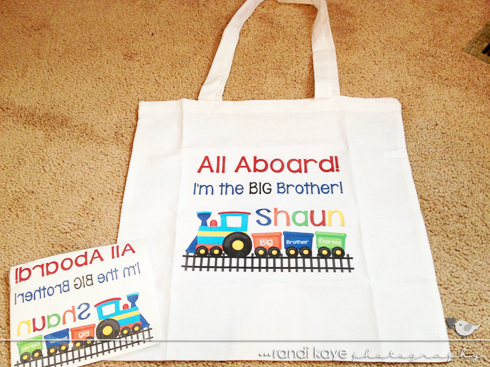 The tote is the absolute perfect size for a fantastic big brother gift bag...plenty of room for books, small toys, and whatever else we come up with to fill it! Afterwards, it will be ideal for carrying library books, his iPad...or more likely, trains!! He usually uses one of mommy's girly bags, so I know he will absolutely LOVE having something that is all his! The quality is great- very durable to last my son for a long while. We have not yet used the iron on (as I am hiding everything from Shaun until the big day), but I'm certain the t-shirt will come out just as wonderful as the tote!! The trouble I have found in our search for big brother gifts has been cost...personalized goodies can get quite expensive! But, the Big Brother/Big Sister kits are a great deal at just $15!! Most of the big sibling tees I've found have cost much more than that, just for the tee! Though the actual tee is not included with the kit, you can find a plain white tee for extremely cheap, making this a very cost effective option...and on top of the shirt, you're getting a matching bag too! 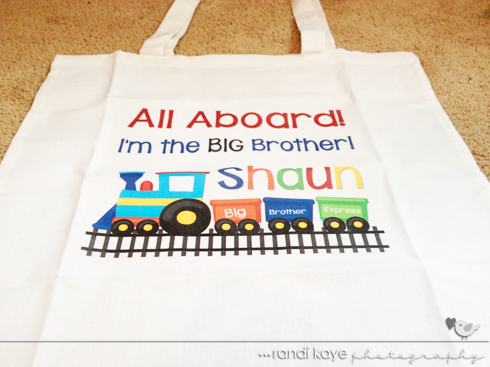 If you're looking for an inexpensive personalized gift for big sibling, Baby Fables is definitely the way to go!! Aside from these wonderful sibling kits, Baby Fables also offers a large variety of baby and kids items. Monthly onesie stickers, bump stickers, personalized iron ons, closet dividers, labels...the list goes on and on. I particularly love all the iron on options...from birthdays, to siblings, to back to school...there is a little something for all occasions...and just $5 each!! And did I mention how ridiculously cute all the designs are!? There truly is a little something for everyone!! I love the Momma to be Belly Stickers - Polkadots, what a neat idea! My favorite item is the Birthday IRON ON TRANSFER - Little Batgirl.